…Easter means that the perfect plan of salvation has been provided. “Christ died for our sins in accordance to the Scriptures…He was buried …He was raised on the third day in accordance to the Scriptures” (1 Corinthians 15:3-4). “God shows His love for us in that while we were still sinners, Christ died for us” (Romans 5:8). …Easter means that He is satisfied with Jesus’ death in our place. “Christ…suffered once for sins, the righteous for the unrighteous [us], that he might bring us to God” (1 Peter 3:18). “Jesus Christ the righteous…is the propitiation [the Satisfier of God’s just punishment] for our sins, and not for ours only but also for the sins of the whole world” (1 John 2:1-2). …Easter is the promise of everlasting life. Jesus promised, “Because I live, you also will live” (John 14:19). And “whoever hears my word and believes him who sent me [God the Father] has eternal life. He does not come into judgment, but has passed from death to life” (John 5:24). …Easter is a challenge to believe. “God did not send his Son into the world to condemn the world, but in order that the world might be saved through him. Whoever believes in him is not condemned, but whoever does not believe is condemned already, because he has not believed in the name of the only Son of God” (John 11:25). The Bible says that “If you confess with your mouth that Jesus is Lord [God’s Son] and believe in your heart that God raised him from the dead, you will be saved” (Romans 10:9). You can know the true meaning of Easter in your life today! Recognize that without Christ you are separated from God. In honest repentance admit your sin and your need to be saved: “For all have sinned, and come short of the glory of God” (Romans 3:23). Realize that God loves you and that Jesus Christ died for your sins. “For God so loved the world, that He gave His only Son [to die in your place], that whoever believes in him should not perish but have eternal life” (John 3:16). “There is one God, and there is one mediator between God and men [mankind], the man Christ Jesus, who gave himself as a ransom for all” (1 Timothy 2:5). Receive the risen Christ into your life by faith—trust Him as your Savior. “God did not send his Son into the world to condemn the world, but in order that the world might be saved through him. Whoever believes in him [Jesus Christ] is not condemned, but whoever does not believe is condemned already, because he has not believed in the name of the only Son of God” (John 3:16-18). “As many as received Him, to them gave He power to become the sons of God, even to them that believe on His name” (John 1:12). Eternal life begins the moment you believe that only through Jesus can your sins be forgiven, and that eternal life only comes from God: “For by grace you have been saved through faith. And this is not your own doing, it is the gift of God, not a result of works, so that no one may boast” (Ephesians 2:8-9). God provides the Holy Spirit to help his children grow because he has good things planned for them. The Bible describes true believers as God’s “workmanship, created in Christ Jesus for good works, which God prepared beforehand, that we should walk in them” (Ephesians 2:10). “If the Spirit of him who raised Jesus from the dead dwells in you, he who raised Christ Jesus from the dead will also give life to your mortal bodies through his Spirit who dwells in you” (Romans 8:11). 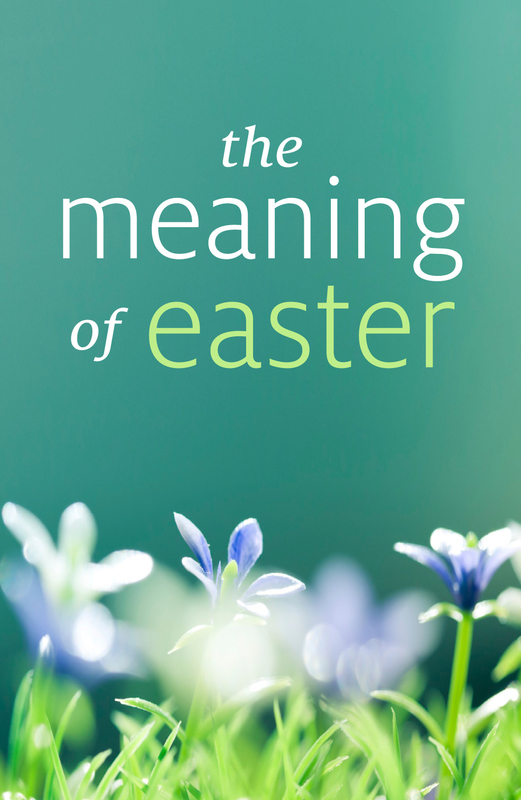 That’s how the true meaning of Easter can makes a difference in your life—now and forever!